The CyberKnife® is an advanced radiotherapy treatment delivery system that provides a non-invasive alternative to surgery for the treatment of both cancerous and non-cancerous tumours anywhere in the body, including the prostate, lung, brain, spine, liver, pancreas and kidney. The treatment which delivers beams of high dose radiation to tumours with extreme accuracy offers new hope to patients worldwide. The Mount Vernon Cancer Centre is the first NHS hospital to purchase a CyberKnife® system and we have been delivering this state-of-the-art technology since August 2010. CyberKnife® is a specialised stereotactic robotic radiotherapy system that uses real-time tracking capabilities to deliver high-dose radiation to tumours with pin-point accuracy. It does not require the use of stabilising frames or uncomfortable breath-holding techniques, which have been required with traditional radiotherapy – thus making the whole process a much easier and more comfortable experience for patients. Typically treatments using the CyberKnife® are completed over one to five days and each pain free session lasts from 30 to 120 minutes depending on the area being treated. Currently, CyberKnife® treatment is only available to NHS patients who fulfill specific criteria set by the NHS England. The service is also available privately – either where someone chooses to fund themselves or their health insurance agrees to pay for the treatment. You can find out how you can get referred for treatment or – for healthcare professionals – how a patient is referred on the Frequently Asked Questions page. 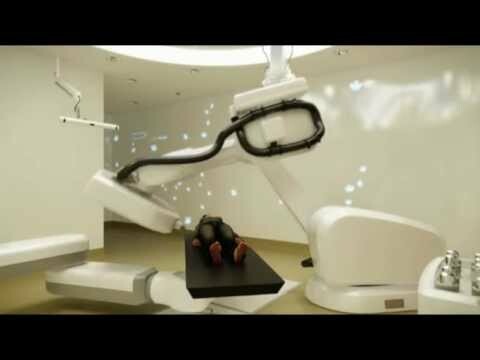 Our video gives you a virtual tour of our CyberKnife® centre.